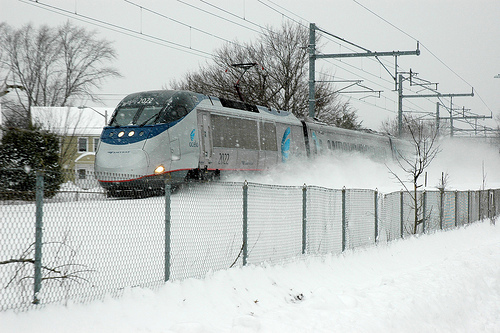 Having just returned by Amtrak from New York this afternoon, I got an interesting view of the snow-bomb that hit the mid-Atlantic region Friday and Saturday. This was such a strange storm because New York and northern New Jersey got zero accumulations and Philadelphia, Baltimore and Washington, of course, got annihilated. So I got my seat on the right side of the train and watched for the line of demarcation. Keep in mind, this is two days removed from the storm. But you started seeing snow at approximately New Brunswick, New Jersey. Maybe 3 to 4 inches from what I could see. By the time we got to Trenton there were about six inches. Then we hit Bucks County north of Philadelphia and you could see that, easily, a foot or more had fallen. I was looking for snow-covered roofs and buried cars and the Philly area was really not that bad in that regard. I did notice a clever little billboard that I think Delta put up just north of Philadelphia that read, “You’d be there now if you were on the air shuttle.” Not this week. If you had tried to take the air shuttle to DC on Friday, you would have spent three days sleeping at the Marine terminal at La Guardia. Amtrak, on the other hand, reinstituted full Acela service today. Plus, Bill Cosby was on my train. Hey, hey, hey. But past Wilmington, as we got into Maryland, you could see what this storm did- in all its glory. Elkton, Maryland looked like a scene from Barrow, Alaska. As we approached Baltimore, you could get more perspective as you saw the height of the snow against the streets that had been plowed. More and more completely snow-submerged vehicles came into view. The heavy snow on rooftops was becoming increasingly evident. There are a lot of woods between Baltimore and Washington and the scenes were breathtaking. Trees were dotted with piles of snow teetering on the branches making them look like forests dotted with thousands and thousands of 50-pound cotton balls. Creeks were swollen with snow that had begun to melt in Monday’s sunshine. Amtrak train #2153, packed to the gills with passengers, finally pulled slowly into Union station. At the last moment back at Penn Station in New York, Amtrak decided to honor all Acela tickets and let on additional passengers- it was literally, standing-room only. We all poured off and I watched the taxi line grow. I know better than to take a DC cab when the city is in a snow emergency. They’ll stick you for a $50 fare for a $10 ride and take great pride in it. So I trudged on to the Metro, still running only subterreanean trains. The tracks that usually head toward Glenmont were the only side of the rails in use and the direction was reversed, heading only downtown and onto the new end of the Red line- Medical Center. The subway train sat at the Union Station platform for about 25 minutes before heading slowly-very slowly toward Judiciary Square. When we hit my stop, Chinatown/Galley Place, there must have been a thousand people waiting to board. It looked like something out of Tokyo where they use poles to push passengers into the trains. Folks looked distinctly disoriented. Like everything had turned alien and totally different, which it had. The two-block walk back to the apartment with luggage was better than I expected. All but a small portion of the sidewalks had been cleaned except for the intersection of 6th and H streets where I stood knee-deep waiting for the light to change. The power had obviously gone off in my building, but thanks to a surge protector, my desk top came back to life. And now we await tomorrow’s, hopefully, final bout of winter weather. It will be nothing compared to the weekend. Just the same and excuse the bad grammar- but I ain’t going nowhere! so glad the Acela was running. We lost power for 36 hours & house is still cold. Slept in coats & hats. With the new forecast, our Saturday trip to Cancun is looking bleak. Notes on the Incoming Storm: Version 3.0 Here Comes the Storm!